Right from the jump I'd like to share Larry Goodman's report from Georgia Wrestling History as Larry does tremendous work with these things. While I do not love doing results and review posts, I feel we've reached the point where it's kind of expected. This came out of a conversation I had with someone who came to this site after a show expecting to find one. I finally decided that I need to give it a shot again, and see if I can find my groove with these things or not. Bobby Flaco v Harry Zen - Flaco is a guy that I am really high on, and he seems to be making the absolute most of his time in ACTION Wrestling. He's clearly gaining momentum in this promotion, and he's definitely a crowd-favorite. Harry Zen is someone I was very curious to see, and he also delivered. You could not ask for more from an opening match as these two put on a show that got the crowd into it right away, and had us off-and-running for the night. Harry Zen's gimmick is pretty unique, and I thought Flaco played off it pretty well. Cain Justice/Jaden Newman v Matt Sells/AJ Gray - Fun clash here that played off of Fred Yehi dealing with Ashton Starr trying to collect Arik Royal's bounty. Newman and Cain were fantastic as heels who weren't sure they really wanted to tangle with Matt and AJ. AJ Gray has really grown on me since I was first exposed to him at a Scenic City event, and Matt Sells is an absolute riot. He's a great guy to have on any show because the crowd eats his shtick up. It's great. Dani Jordyn v Allie Kat -As I said leading up to this one I was looking forward to seeing Allie Kat finally, and I really liked her. I already knew that I (and Tyrone in general) liked Dani Jordyn. They didn't disappoint as this match had a hot ending. Aja Perera showed up and laid out Dani in an Orndorff and Hogan manner. Aja looks like a natural heel, I was shocked to be told she's never been one before apparently. O'Shay Edwards/Alan Angels/David Ali v Ryan Rembrandt/James Bandy/Stevie Richards - First off, Stevie Richards is awesome. He really was a pro's pro, and on the independent scene you really realize how tall he is. He's also in fantastic shape. I was pleasantly surprised how much he was involved in this match as well. I am really high on James Bandy (who I continue to refer to as ACTION's Hometown Hero), and Ryan Rembrandt is also very impressive. They are easy guys for the ACTION crowd to root for and the exact opposite can be said of the opposing team. Angels and O'Shay are a great bully jerk team and I like the dynamic of O'Shay being Angels' heavy. David Ali was good here as well. My son looked at me as Angels/O'Shay/Ali cut Rembrandt off from his partners and said, "They are doing just like The Andersons and cutting the ring off on him." I don't think I have ever been so proud. Good match. Anthony Henry v Slim J -I was asked right after the show what I thought match of the night was, and I went with this one. These two tore it up BIG TIME. Put on an absolute clinic, and it works so much better because the ACTION crowd already loves Slim J, and figured out early on that they hated Anthony Henry. Henry getting the win with a handful of tights/pants only played into that more. The Carnies (Kerry Awful/Nick Iggy) v Team TAG (Billy Buck/Kevin Blue/Chris Spectra) - This was another serious match of the night contender and the whole recipe is pretty simple. This thing was wild as could be, and we all just ate it up especially with ACTION CEO Matt Griffin having to count the pin on Team TAG. AC Mack (c) v Cam Carter -Much like a couple of other matches here you've got an easy formula. You hate the champ, and you love the challenger. I always have this fear that when I talk about how good AC Mack is at talking that I'm underselling his ability in the ring. He can absolutely do both, and him and Cam delivered. I often talk about how certain guys do all the little things right, and AC Mack is a prime example of that. Everything he does in there is 100% believable whether it's the faces he makes, how he wrestles or how he riles the crowd up on the mic. Cam Carter is a great challenger because of the flashy high-flying offense too. They really do match up perfectly. We ended up with Cam Carter getting a visual pin on AC Mack AND then being pinned with his feet on the ropes so the rematch has already been set for Sandy Creek HS at ACTION Wrestling 7! 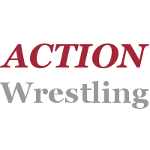 All in all I thought it was a really enjoyable show, and ACTION's ability to overcome the usual issues related to independent wrestling really is admirable. I've had confidence in this promotion since I heard it was going to launch and to this point they have not let me down. They are doing something really special right now, and I'm glad I got involved early on. It's been a treat to watch this thing grow.